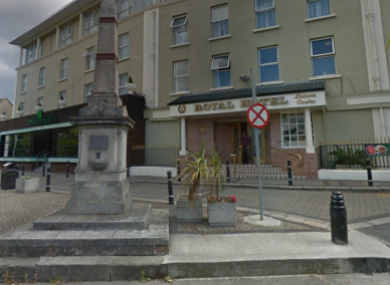 The Royal Hotel in Bray, Wicklow. A MAN IN his 40s has been questioned by gardaí investigating the death of 45-year-old Vincent Kelly in Bray, Co Wicklow, earlier this month. Kelly, who was originally from Newtownmountkennedy in Wicklow, was found with a severe head injury outside the Royal Hotel on Bray’s main street at around 2am on Saturday 9 June. He was treated at the scene before being removed to Beaumont Hospital where he died of his injuries. The man was arrested this morning and detained at Bray Garda station. He has since been released without charge and a file is being prepared for the Director of Public Prosecutions. Gardaí renewed their appeal for information about the incident this evening. Anyone with any information is asked to contact Bray Garda Station on 01-666 5300, the Garda Confidential Line on 1800 666 111 or any Garda station. Email “Arrest made in connection with death of man in Bray”. Feedback on “Arrest made in connection with death of man in Bray”.